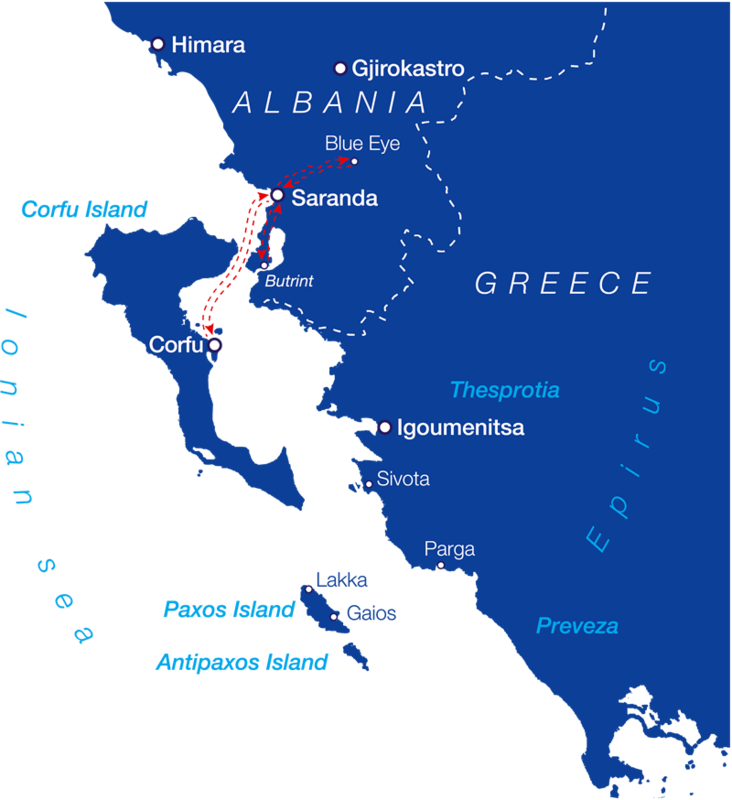 From the Port of Corfu, we follow the Albanian coast to the city port of Saranda. After a short coffee break in Saranda, a 20 km guided coach tour of the south coast’s virgin shores and scattered islands is available for those who want it. Leaving the mainland again, we pass small picturesque villages and endless fertile plains that lead to a great lake. The highlight of your day will be a visit to Butrint – an UNESCO World Heritage site. Over the centuries, the ancient town had disappeared under layers of silt and vegetation. In recent years, however, archaeologists have uncovered some of the finest working town remains in the Mediterranean. At the edge of the lake is the ancient city of Vouthrota. The Venetian Tower near the entrance, the ancient theatre, the Temple of Asclepius, the ancient gymnasium, the Roman Baths, the Roman Baptistery with its priceless mosaic floor, the Lion gate and the enormous Cyclopean walls will transport you back in time from 2,500 years till the 3rd century A.D. At the top of the hill stands the Venetian Castle, offering breath-taking, panoramic views of the ancient city, the lake and the vast plains below. Lunch is served upon your return to Saranda, after which there is a visit to Blue Eye – an underground spring more than 50 meters deep that creates a lake whose turquoise waters will fill you with feelings of energy and peace. In the afternoon, there will be a walking tour of Saranda, after which we finally depart this land that time forgot. 11:20 Arrival at the archaeological area of Butrint. Tour lasts between 90-110 minutes depending on age. The tour for elderly or disabled guests will include 70% of the archaeological area (with a separate guide when necessary). There is a small bar/kiosk at the entrance to the site. Public bathroom facilities are available at the end of the tour in the Venetian Castle on the Acropolis hill. meatballs, baked potatoes, seasonal fruit. This full day cruise is not recommended for elderly people or families with young children. Our company provides coach transfers to and from the hotel and the main Port of Corfu. There is parking area in the Port of Corfu. (3 euros for 24 hours). The departure time is subject to slight change according to local traffic conditions. Duty Free is available at the Port of Corfu. (Please pay attention to restrictions listed at the Customs Office at the Port of Corfu regarding goods declaration). For citizens of an EU country a valid ID-card or a valid passport is required on the day of travel. 9. Children under the age of 18 are not accepted on board without being accompanied by the two parents or an adult person. Children being accompanied only by one parent, the other parent must sign a written authorization. For cancellations at least 12 hours before the scheduled departure, no cancellation fee applies. For cancellations within 12 hours of the scheduled departure, a 100% cancellation fee applies. The cruise is subject to favourable weather conditions. In the event of the cruise being cancelled due to poor weather, you will be given the choice between an alternative date or a full refund. After departing from the port of Saranda, we travel along the Albanian coast until we approach the Port of Corfu….